It is always a sweet argument between me and my husband that women have so many varieties than men in Traditional Indian clothing(Indian ethnic wear) . when I started looking for men's ethnic wear, I found a decent collection of different fabrics and different styles. Sherwani is a classic and perfect for Indian bridegroom.usually, traditional Indian marriages bridegroom’s dress too attracts every one. Sherwani is an Impeccable asset to any bridegroom.There are many varieties of sherwani style. Achkan Sherwani(simple sherwani), is the most popular and preferred by many Indian bridegrooms, it is a long kurta and has side slits and front slits and can wear with the chudi bottom or dhoti pants. Even bride/bride groom’s relatives wear those sherwani (Indian traditional wedding dress)with less designer work on them. Chipkan style sherwani (Indian groom wear), these sherwani has an ancient history background, we borrowed this style from famous Mughal emperors.They give you a royal look like in the movie named Jodha Akbar where Hrithik wore this variety sherwani as a king. 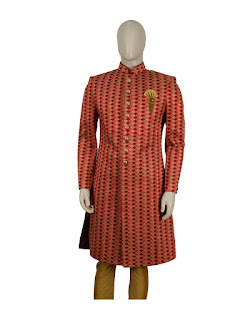 Indo western sherwani, these sherwanis are comfortable and gives you modern look(Famous for Indian weddings and ceremonies), in one word we can say it is a fusion of Indian ethnic style and western style.The special attraction of these sherwanis are Royal buttons, stones, beads and gems on the kurta. Jodhpur sherwani(Royal Rajput Wedding shervani) is a Royal Rajput sherwani.You can pair it up with jackets, cufflinks, churidars, and stoles give u a royal look. Pakistani sherwanis are heavy worked ones, stylish and vibrant suits are perfect for Indian grooms.Men can wear this even for Indian wedding parties. 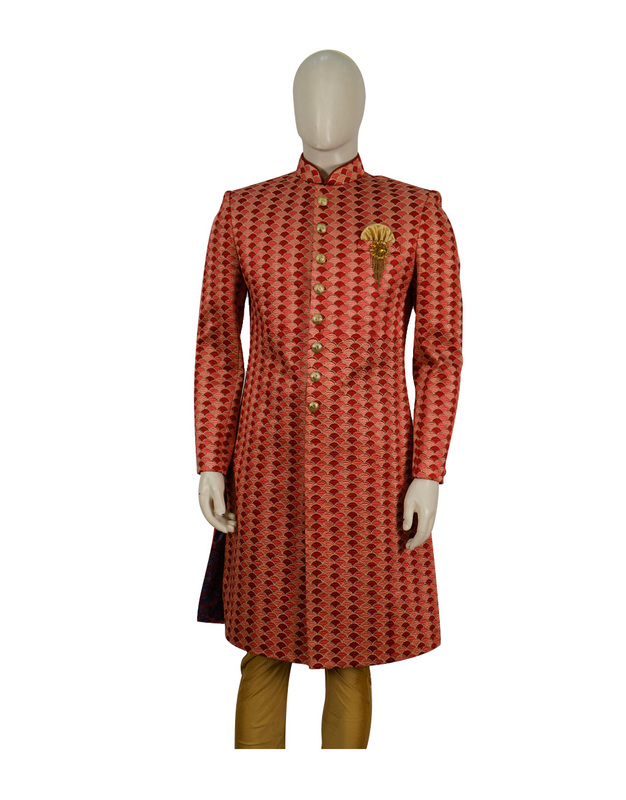 Jacket style sherwani is the Latest sherwani design,which gives you a prince look. Anarkali sherwani and Sultan style sherwani, there are many varieties which shows the work of India. I found different variety of sherwani in most of the Bollywood movies like (bajirao mastani,Jodha Akbar,upcoming movie padmavathi). 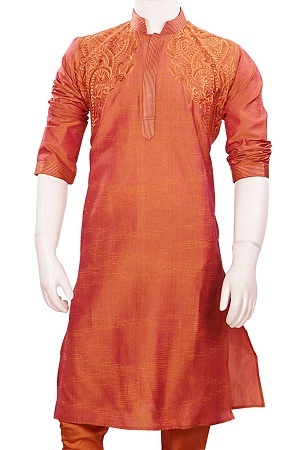 Kurta – Pyjama is a ubiquitous style worn by adults men, teens, boys. These days there are so many varieties of baby boys too with Punjabi style lose bottoms. simple cotton kurta pajama for daily use. Traditional kurta pajama to be used for temples, gurudwara etc. Silk with design work for parties and marriages. Heavy designer for a host of marriages/parties. Even south Indians wear Kurta on traditional Pancha bottoms. Multiple styles can be blend with Kutas. Nehru style suits are very famous nowadays. Modi style suits are getting popular too. Pathan style kurtas are also given rugged and different look. The Dhoti, also known as Panche, Vesti, Dhuti, Mardani, Chandra, Dhotar, and Pancha, is a traditional men's garment worn in India. It is a rectangular piece of unstitched cloth, usually around 4.5 meters (15 ft) long, wrapped around the waist and the legs and knotted at the waist. 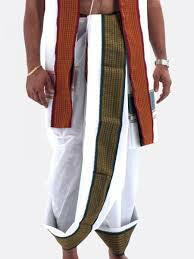 Dhoti is the never ending style in South India. Everybody used to wear Dhotis prior to British era. After globalization, probably people started looking for pants for office work etc. Some Hindu temples make it mandatory for men to wear dhoti in temples. Khadi shirts jell with White dhoti; Majority of Tamilnadu, Kerala, Andhra Pradesh, Telangana politicians wear dhotis. All elderly men in south India wear the only dhoti for regular use. 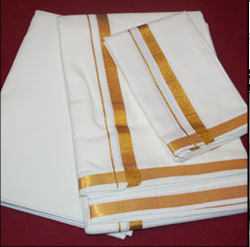 Even as a token of respect during marriages, parties only Dhoti and Khanduva are presented to the elders. So many companies started and prospering on pure cotton and different varieties of Dhoti production. Lungi is one variety in Dhoti; Multicolored with designs for rough usage; They are not preferred for marriages or parties. They are worn as a casual wear while being at home or sleeping etc. Panchakacham has been there for many centuries in India. We can convert DHOTI to panchakacham (if we know the process to do so); Mahatma Gandhi used to wear a dhoti in panchakacham style. Most of the South Indian Politicians like wear panchakacham for daily usage too.In the movie Bahubali you can find protagonists in traditional panchakattu. If you can see any Hindu homams like (Rudra homam, Ganesha homam etc) all the ritwiks need to wear panchakacham only, i saw my dad wears panchakacham when performing homas and other important religious activities. Even different colored silk designer readymade panchakachams are being made for kids, tots, and teens too (undoubtedly all celebrity kids will have photos of these dresses ). Linen shirts from India are a rage nowadays. They are a bit costly compared to normal shirts (cost of the cloth, stitching, maintenance etc). But then the look and feel will be completely different compared to normal shirts. 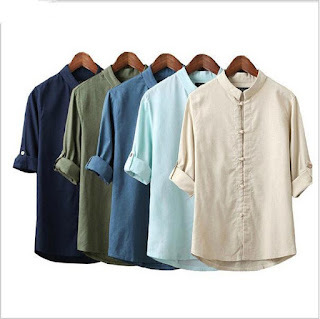 My hubby always buys at least a couple of shirts from India (during our vacation to India) and get them stitched over there (as it is very costly in the USA to buy the cloth too) Protagonists in movies too wear different varieties of linen shirts (after being remodeled or redesigned) for rugged look. They suit well to the working class men. Even for simple parties people wear them for the official/class look. My hubby always wears Linen shirts to Hindu temple. Ayurvedic Products Diwali Food gifts Health & Beauty Home Decors Indian clothes Indian clothing Indian dresses Indian kurtis Indian lehenga Indian Salwar kameez Indian Sarees Indian Traditional Cloths Indian Traditional Games Jewellery Kalamkari Sarees Kitchenware namkeen Online stores Patanjali Products Pickles Pooja Items Press Release PressRelease Rakhi Snacks sugar free sweets Sweets Where to buy?